Floodwater from a severe, weeklong storm started pouring through the walls of Becky Bentley’s home. In the short time it took her and her son to run upstairs and grab the family cat, the rising water had trapped them on the second floor of their home. With the help of a neighbor, they managed to escape. Floods are the number one natural disaster in the United States. According to FloodSmart.gov, nearly 20% of flood insurance claims come from moderate- to low-risk areas, although, as Becky learned, all property is exposed to some risk. When floodwater is inches from your door, it’s much too late to wonder if your homeowners and personal umbrella policies cover flooding. Often they do not. Many parts of the country experienced higher than normal snowfalls this year. With warmer months (hopefully) approaching, a midwinter or early spring thaw is not far behind. With that comes the potential for large amounts of runoff in a short period of time. But there’s more. Since the ground is still frozen, water cannot penetrate it and be reabsorbed. The water has to go somewhere. Traditionally, that includes lakes, streams and rivers. When there’s an excess amount of water, however, it spills over the banks and into streets, businesses – and possibly your home. 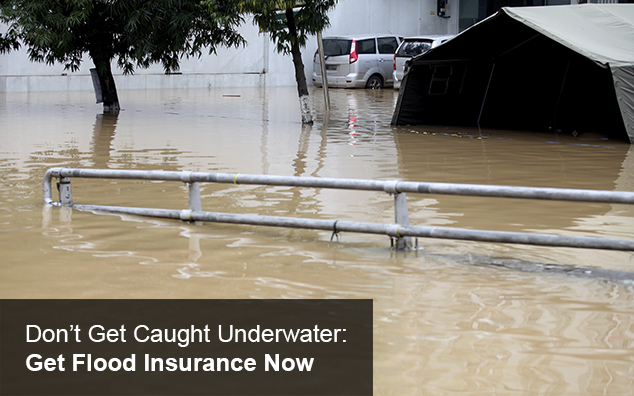 The smart choice is to purchase flood insurance now to provide the protection you need later. Keep in mind that there is no such thing as a “no flood zone”. Premium costs vary based on the amount of coverage you need, what’s covered and your property’s flood risk. Don’t get caught underwater! Contact PDCM Insurance to learn how you can protect yourself, your loved ones and your important assets with a specifically designed flood insurance policy. Flood policies have a 30-day waiting period, so contact us today! February 16, 2015 in Flood Insurance.